To prevent accidental removal of the AC power cord, it is recommended to install the power cord clip together with the power cord. 1. With the rough side facing down, insert the Tie Wrap into the hole below the power socket. 2. Plug the AC power cord into the power socket of the Switch. 3. Slide the retainer through the Tie Wrap until the end of the cord. 4. Circle the tie of the retainer around the power cord and into the locker of the retainer. 5. Fasten the tie of the retainer until the power cord is secured. The D-Link GO-SW-16GE can easily be mounted on a rack. Two mounting ears are provided for this purpose. Make sure that the front panel is exposed in order to view the LEDs. 1. Attach the ears to each side of the switch, using the screw-holes located on the side of the device. 2. Firmly attach the ears to the rack. Please follow the usual safety precautions for rack-mountable products. Plug the supplied power cord into the Switch and the other end into a power outlet, power strip, or surge protector (recommended). Verify the Power indicator is lit on the Switch. Connect one end of an Ethernet cable in the device you want to connect to the Switch and the other end into one of the Ethernet ports on the Switch. Check the Link lights (LEDs) on both the Switch and the device to verify that the cable is good and that there is a valid connection. Note: A Category 5 (or higher) Ethernet cable must be used for 100Mbps or higher operation. 1. If there is no link on a port (when there is no connection or the device connected is turned off) the port(s) will enter a “sleep mode” which will drastically reduce the amount of power used. Children have STRANGLED in cords. Keep adapter cord out of reach of children (minimum of 3 ft or 1m away). NEVER place the camera or adapter cord inside the crib or child sleeping area. Do not use extension cords. This product is NOT intended to replace proper supervision of children. 1.Plug in your D-Link DCS-825L camera and wait until the Power LED turns green. You can use the included power adapter, or you can use a portable USB battery (not included)that can supply 5 V / 2 A of power. 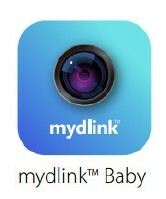 2.Download the free mydlink Baby Camera Monitor app on your smartphone or tablet. 3.Connect to the Camera’s Wi-Fi signal. The Wi-Fi network name and password are located on the label on the back of this booklet. 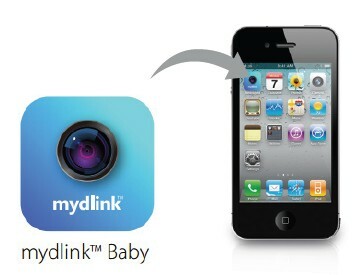 4.Launch the mydlink Baby app. The app will guide you through the configuration process. Remove the top cover of your device by pressing the push button in and then lift the cover up. Attach the strap to your hard drive(s) with the supplied screws. Insert one or two 3.5” SATA hard drive(s) into the drive bay until they are firmly seated. Then, re-attach the top cover. Plug an Ethernet cable to the Ethernet port on the back of the device and plug the other end to your network via a router or switch, or directly to a computer for configuration. Connect the power adapter to the device and then connect the other end into a power outlet or surge protector. Press the power button on the front of the device to turn the device on. Open a web browser and enter the IP address of the D-Link DNS-320L to access the Web UI. If you have a DHCP-enabled router on your network, you may need to check the DHCP table to see what IP address the DNS-320L was assigned. Note: The computer used to access the ShareCenter® web-based configuration manager must be on the same subnet as the ShareCenter®. If your network is using a DHCP server and the computer receives IP settings from the DHCP server, the ShareCenter® will automatically be in the same subnet. Select System Administrator and click the Login button (leave the password blank by default). Once you are logged in, click Management and then click Setup Wizard. Follow the on-screen instructions to configure your D-Link DNS-320L. Note: Please refer to the manual for more information. The D-Link DNS-320 ShareCenterTM Pulse 2-Bay Network Storage shares your documents, photos, music, and videos across the network and on the Internet so family members, friends, or employees can access them. This ShareCenterTM Pulse can hold two 3.5” SATA hard drives and is able to create a central network point for backing up valuable files. The Setup Wizard on the CD-ROM will give you step-by-step instructions how to connect, install, and configure your DNS-320. Insert the supplied CD-ROM into your computer. When the autorun screen appears, click ShareCenterTM Pulse Setup Wizard. Follow the on-screen instructions. Once complete you can log into the DNS-320 for advanced configuration. Remove the top cover of your device by moving the cover lock located on the back of your device and moving the cover lock to the right. While holding the cover lock, slide the top cover backwards. After sliding the top cover backwards, lift the top cover up to remove it. Insert a 3.5” SATA hard drive into an available drive bay. Then, re-attach the top cover. Connect an Ethernet cable to the available Ethernet port. This cable should connect the ShareCenterTM Pulse 2-Bay Network Storage to your local network via a router or switch, or directly to a computer for configuration. Connect the power adapter to the power receptor. Open a web browser and enter the IP address of the DNS-320 to access the Web UI. If you have a DHCP-enabled router or server on your network, you may need to check the DHCP table to see what IP address the D-Link DNS-320 was assigned. Note: The computer used to access the ShareCenterTM Pulse web-based configuration manager must be on the same subnet as the ShareCenterTM Pulse. If your network is using a DHCP server and the computer receives IP settings from the DHCP server, the ShareCenterTM Pulse will automatically be in the same subnet. 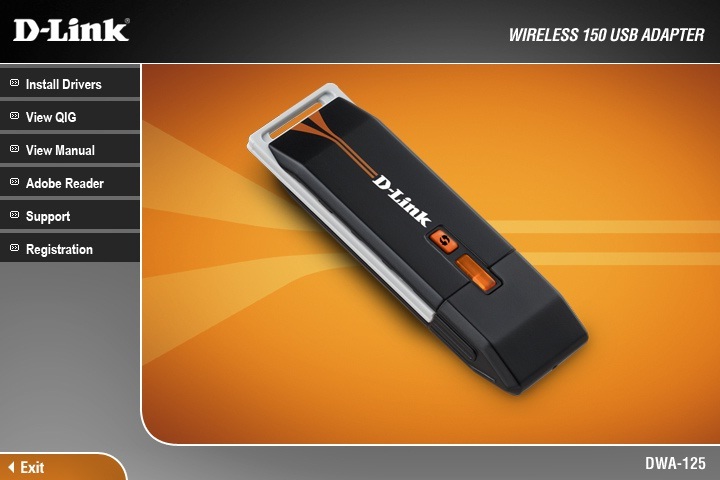 Before You Begin Install the D-Link DWA-125 Wireless 150 Usb Adapter. D-Link USB adapter, make sure the software is uninstalled before installing the new software. Some utilities may cause a conflict with the new software. If you plan to use multiple adapters at different times, make sure the utilities are not set to load when your computer boots up. Windows® XP/Vista™ users may use the built-in wireless utility for all adapters. Warning: Do NOT install the DWA-125 USB Adapter into your computer before installing the driver software from the D-Link CD. Turn on the computer and insert the D-Link DWA-125 Driver CD in the CD-ROM drive. If the CD Autorun function does not automatically start on your computer, go to Start > Run. In the run box type “D:\DWA125.exe” (where D: represents the drive letter of your CD-ROM drive). When the autorun screen appears, click Install Drivers and follow the on-screen instructions to install and configure your wireless adapter. After installation, the D-Link DWA-125 uses the Wireless Connection Manager as the management software. The manager provides the user an easy interface to change any settings related to the wireless adapter. Clicking on the Wireless Connection Manager icon on the desktop will start the Configuration.